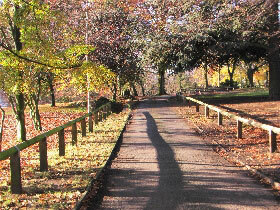 Torkington Park is the main park in the Hazel Grove area and the home of the Secret Garden. The formal flower garden is a great place to walk round or just sit down and enjoy the wildlife. It has proved to be a major attraction to the park since its re-opening in May 2000 by celebrity gardener Jeff Turner. Torkington Lodge & Estate were purchased by Hazel Grove and Bramhall UDC in 1935 to be used as the Council Offices with the parkland available for recreational purposes. Torkington Park covers an area of 13.70 hectares (33.85 acres). Torkington Lodge, a grade II listed Regency building, dominates the landscape from its elevated position. Overall there is very little evidence of the parks Regency heritage left and generally amenity grassland with trees of varying maturity forms the landscape. The Friends of Torkington Park was established in January 2002 to work with Stockport Council and other agencies to improve the park facilities for the whole community. Their hard work paid off in December 2003 when a new toddler play area was installed in the park. Look out for the many events and great days out that the Friends organise on the park such as the Halloween Trail and Christmas Carols. The hard work continues with the aim of making Torkington Park a park that is used and enjoyed by all the community.